At a recent graduation brunch, I was sitting next to a young lady at the Queen Street Diner in Strasburg who ordered scrapple. After it arrived, she inquired what was in it. Her mistake should be readily apparent: You don’t ask what’s in scrapple AFTER you have it sitting in front of you. Upon receiving an answer, she didn’t eat a bite. Look, if you’re going to order some pig product, you have to understand something: There are all kinds of ovine delicacies including pork chops, pork roast, pulled pork, ribs, and bacon. These all have individual names that are suggestive of what they are. Then, too, you have hot dogs and sausage, both of which are flavorful even if their respective characters are somewhat shady. Kind of like that neighbor who ran an import/export business and always had cash in his pocket. When he bought you and all the neighborhood kids a root beer, you didn’t question it, you just enjoyed it. Scrapple is a different matter, however. It has “crap” in the middle of its name. Make this a rule: If a food name has “crap” in its name somewhere, assume that the food does, too, and don’t order it. And if you even think of ordering puddin’ without being certain that you’re willing to eat stuff that isn’t even good enough to go into scrapple, then think again. You’re welcome, and bon appėtit. This entry was posted in Uncategorized and tagged puddin', Queen Street Diner, scrapple, what not to have for breakfast. Bookmark the permalink. But Austin, I LIKE scrapple! Haven’t had any for years, probably due to not eating many breakfasts out at country dining spots. I am sure it’s full of stuff that is heart stopping and artery clogging, not unlike sausage. Speaking of sausage, have you read Michener’s Centennial? There is a wonderful description of country sausage making, makes my mouth water just thinking about it. Whoever said sausage and law making are on a par is most uninformed. Hey! 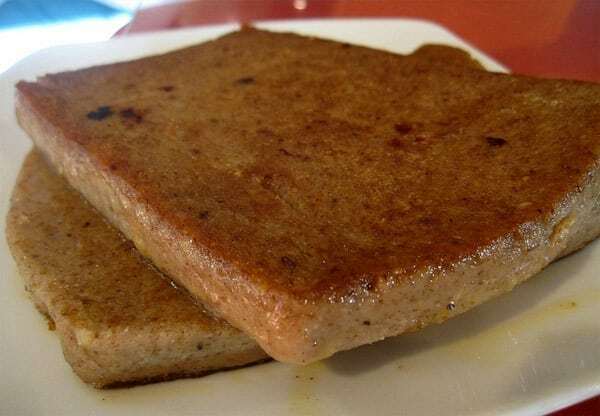 I’m not saying you shouldn’t like scrapple, just that it would be a good idea to know what’s in it before your order or don’t bother asking, lol! Lol, thanks, Buffy. Haven’t had good apple butter in a long time!